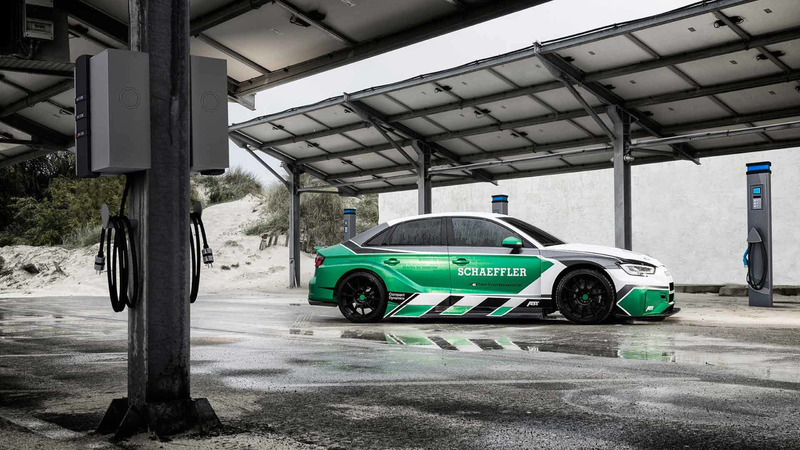 The “Schaeffler 4ePerformance” concept vehicle demonstrates with its impressive driving performance how quickly modern motorsport technology can be put on the road. 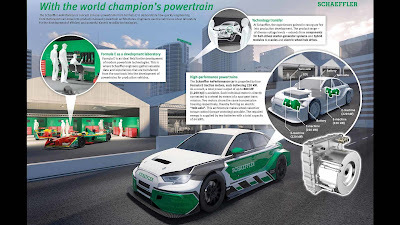 The “Schaeffler 4ePerformance” is a good example of how technology is transferred from motor racing to a close-to-volume-production drive concept. The fully-electric vehicle is powered by four Formula E motors with a total power output of 880 kW (1,200 PS) that come from the ABT Schaeffler FE01 Formula E racing car. All of the four drives have been in use throughout the entire second Formula E season – and very successfully. What is more, these electric motors were the basis for world champion Lucas di Grassi’s electric drive from his 2016/2017 championship season. Schaeffler has been active in ABB FIA Formula E, the world’s first electric racing series, from the first season. This makes the automotive supplier one of the pioneers of electric mobility that have believed in the vision of electric motorsport. The electric racing series is an ideal test field for the development of electric mobility technologies and perfectly suits the company’s corporate strategy “Mobility for tomorrow”, with which the globally active technology group helps shape the future of mobility. 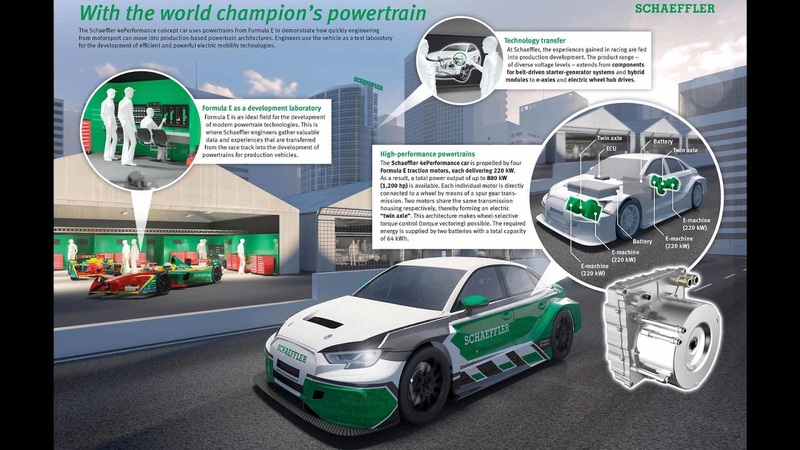 The relevance of the development close to volume production is especially reflected by the “Schaeffler 4ePerformance” concept vehicle, where knowledge of comprehensive systems expertise, drives, and software and battery management is transferred directly to all of the Schaeffler Group's development departments. In the case of the “Schaeffler 4ePerformance”, the relevant expert areas of Schaeffler Motorsports, the Schaeffler E-Mobility business division, and the company’s subsidiaries Schaeffler Engineering and Compact Dynamics have worked closely together, and were complimented by ABT Sportsline’s expertise with regard to the entire vehicle. The impressive high-performance vehicle is based on the steel body of a high-volume production vehicle. The implementation of this project resulted from a joint idea by Lucas di Grassi and Prof. Peter Gutzmer. The objective of this idea was to gain the best possible learning results from Formula E and apply them to volume production. 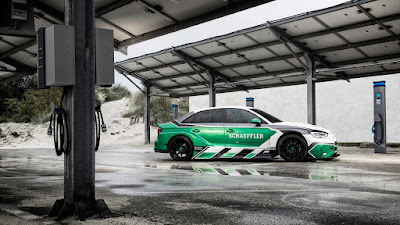 The “Schaeffler 4ePerformance” is powered by no fewer than four Formula E drives from the winning ABT Schaeffler FE01 racing car, each of which provides a power output of 220 kW. In total, an all-electric drive power of up to 880 kW (approx. 1,200 PS) is available, accelerating the concept racing car from 0 to 200 km/h in less than 7 seconds. Each individual motor is directly connected to a wheel by means of a spur gear unit, while two motors share one gearbox housing and thereby form an electric twin axle. This architecture enables selective control of drive torque to individual wheels (torque vectoring). The power required for this is provided by two batteries with an overall capacity of 64 kWh. “For Schaeffler, this vehicle is a test laboratory on wheels thanks to its free scaling options for the drive power. We are currently testing and developing our own driving dynamics control system, which is based on physical vehicle and wheel modeling. We have been learning a lot especially in the area of software-based driving dynamics control systems”, says Simon Opel, Director Special Projects Motorsports at Schaeffler. “In the same way as Schaeffler has contributed its technical expertise to Formula E from the very beginning, it also plays a pioneering role and is a partner for components and complete system solutions when it comes to applying electric mobility to volume production vehicles and putting them on the road”, says Prof. Peter Gutzmer, CTO of Schaeffler. The automotive supplier offers a wide range of products for electric mobility and the electrification of the entire drive train: From technologies for 48-volt hybridization and high-voltage hybrid modules that have been tested in volume production through to modular electric axles that will soon also be applied in renowned upper-class electric vehicles in Europe, after first volume-production solutions have been offered in China. 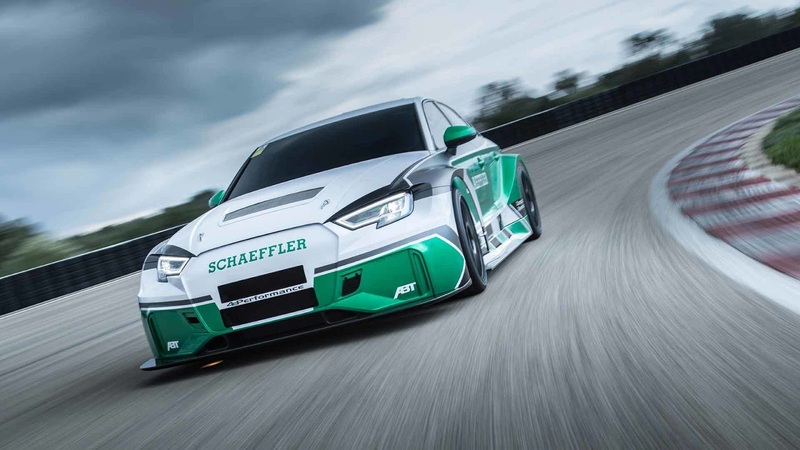 “Schaeffler 4ePerformance” could be a supplement to volume-production drive concepts for electric high-performance sports cars. Motor and gearbox efficiency of approx. 95 percent under full-load conditions.